Mac Minerlize Skinfinish in Lightscapade, Chanel Vitalumiere Aqua Foundation, Revlon Photoready Foundation, Sephora mineral powder, YSL concealer. I really love reading about "best of 2011 products", so I decided to write my own version in the same format as Lily. I'm planning to include Top 5: Nail polishes, Lipsticks, Eye products, Body products etc. These are my favourite products. Feel free to share your favourites, I love trying out new things. Mac Minerlize Skinfinish in Lightscapade: This is my favourite highlighter, I love using it on my cheeks bones. It's makes my skin look really glowy. It's Limited Edition, so is no longer available on the Mac site. Wonder what I'm going to do if I run out. Chanel Vitalumiere Aqua Foundation: I'm a foundationholic, I have quite large collection of foundation and I still want more! This is the best light coverage I ever tried. It's doesn't feel heavy on my face, smells amazing. It is expensive but worth the money. I'm willing to try out more Chanel foundation in future, but for now I want Estee Launder Double Wear, just because I would like more coverage on bad skin days. Revlon PhotoReady Foundation: Another favourite foundation it's so hard to pick one, when you are a foundationholic. My favourite high street foundation. I think I will never get bored of this foundation. Overall it's really good, it's doesn't break me out like most foundation do. Does contain some glitter particles, but they aren't going to make you look like a disco ball. Sephora Mineral Powder: I run out of my Rimmel Matte Powder, one of my favourite! I think this works as well as the Rimmel powder. The colour is a little bit darker thank my skin tone, but it doesn't make me look orange. It's really soft as most powders, great for setting foundation. It's a really nice powder. YvesSaintLaurent Concealer: This is such a amazing product! I think it's the best concealer I ever used. It's covers the dark under eye circles. My undereye circles aren't that bad, so I don't need a lot of coverage. The coverage is buildable. The brush it's very soft. My favourite is the MAC mineralise. I'm literally obsessed with it, && MAC in general. 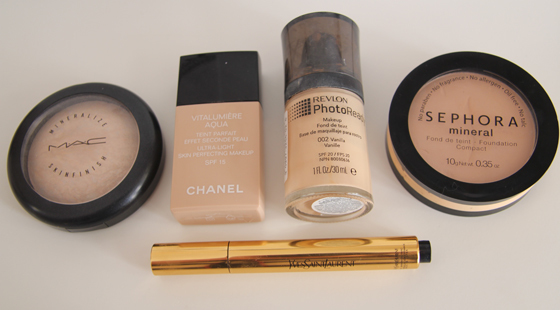 Chanel Vitalumier Foundation is my favourite.